Searay boats are very well known to the WA marine industry, a popular choice with clever design and good resale value when the time comes to upgrade. 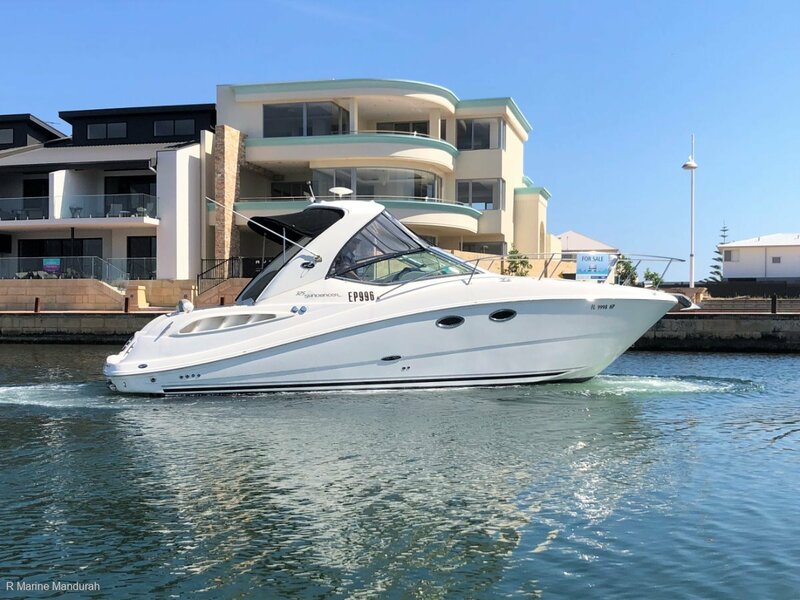 Sold by R Marine Mandurah in 2018 this Searay 325 is back on the market as the current owners have decided to upgrade already ! the day relaxing on the Swan River or tucked up against the beach at Carnac Island. A boat of this size is just as comfortable on a mooring as it is backed up to the sand with a rear anchor to the beach. Sneaking into some of the best spots we have to offer in WA needs a boat of this size. Fresh carpets installed in late 2018 lead you to the twin helm seat, wide and deep with a bolster cushion for those that like to stand and drive. The helm is a typical Searay design, easy to navigate and all that you need is close to hand. Northstar electronics provide the navigation and the Searay standard digital depth gauge provides the depth. An easy and hassle free installation. Making your way forward through the windscreen and built in folding steps is a breeze, roll up the front clears, flip back the glass screen and the bow is yours to relax on. Soak up the sun or show off your best diving skills to the kids. Dad can still cut it with the young ones... Cant he ? Space has been very well used in the cabin with the cabin door set to the Port side maximising the available space in the cabin, plenty of room for two adult couples to spend the night with a large forward berth that doubles as a lounge if required and a good size aft transverse berth. Plenty of room to utilise the galley thanks to the wide beam of the Searay 325 and an additional lounge opposite acting as a dinette when you install the table. Plenty of available storage so your boat can stay clutter free. Powering the Searay 325 is a pair of Mercruiser 5.0 Mpi multi-point injection engines paired up with a pair of Bravo 3 stern drives with duo props. The ideal combination it seems. She will skip along at a comfortable cruise in the 22knot range all day and may sprint to around 30 knots if the sea allow. Comfortable cruising with economy on your side. Currently showing around 500 hours there is plenty of life left in the Family cruiser. The Searay 325 is a great way to kick off your cruising life in WA allowing you to make the most of what the WA boating life has to offer, cruising the river and taking in the sights of Elizabeth Quays, heading over to Rotto and tasting the famous Rotto bakery cream buns or relaxing with your feet in the water a Carnac Island swimming with the seals. What's not to like ? Call the Team TODAY to arrange a suitable time to bring your family across this unique opportunity in the WA market. Arrange the appointment through Paul on 0427 949 293, Carl on 0407 949 293 or contact the Office on 9583 5355. With a lifetime invested in the WA Marine Industry at all levels and thousands of boats sold Paul Denboer and the team at R Marine Mandurah WILL sell your boat and are proud to offer a NO SALE NO FEE structure to all our valued clients. Why entrust your precious boat to just anyone ! Great family cruising an ideal way to start your journey in boating.